Sig Sauer, Inc. has introduced the M400 TREAD, a premium entry-level rifle, accompanied by a full-line of TREAD branded accessories that gives the consumer the freedom to grow—what the company says is “The new face of Freedom.” It’s a premium rifle, at a moderate price point, that is packed with innovation and flexibility. The M400 TREAD is an optics ready, aluminum frame rifle, featuring a 16” stainless steel barrel with a free-floating M-LOK handguard, a single-stage polished/hard-coat trigger, ambidextrous controls, a Magpul™ SL-K 6 position telescoping stock, a mid-length gas system, and is available in 5.56 NATO. 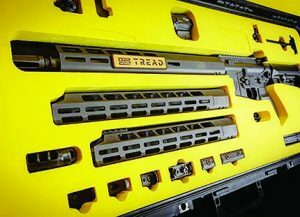 The TREAD branded accessories include: an M-LOK handguard with lightening cuts to reduce weight, available in 13” and 15” lengths; a 3 chamber compensator; an ambidextrous charging handle made of aircraft grade aluminum and a dual roll pin design; a ROMEO5 optic featuring a 2MOA dot with ten illumination settings, MOTAC, and 50k battery life; flip-up front and rear iron sights that are easy to install, adjustable, and deploy quickly; an M-LOK front sight adapter with co-witness height made of lightweight aluminum; multiple configurations of M-LOK grip kits. Weight (including magazine) is 7 lbs. and the TREAD features a 1:8 barrel twist. MSRP is $951. 1791 Gunleather®, innovative manufacturer of premium hand-crafted leather gun holsters and belts, has announced the introduction of the next evolution in premium leather holsters. The new “Project Stealth” gun holster series by 1791 Gunleather combines American heavy native steerhide with state-of-the-art flexible carbon fiber for the first-ever holster utilizing a proprietary, patent-pending combination of the two materials. The new line of luxury, wearable personal protection holsters incorporates the same patented, American-made CX6® carbon fiber, manufactured by Carbitex that is used by well-known premium brands in the modern automotive, high-end luggage, and professional athletic apparel markets. “Project Stealth is like no holster you’ve seen before in terms of its contemporary, elegant look and exceptional, high-tech performance,” said 1791 Gunleather CEO Ramiro M. Romani. “The patent-pending Project Stealth series of holsters is where luxury, old-world craftsmanship, and the finest quality materials unite to deliver the most intriguing and fashionable EDC holsters ever seen. 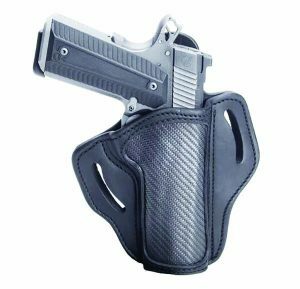 This outside-the-waistband series of holsters is not only lightweight and flexible, but extremely durable and aesthetically stunning,” he said. The 1791 Gunleather passive retention system is perfected by adding flexible carbon fiber to the mix. “And, while the carbon fiber you’re used to seeing in holsters is lightweight and strong, it’s also very rigid, inflexible, and tends to scuff your firearm. The advantage of using the state-of-the-art CX6 carbon fiber is that it’s malleable,” Romani said. CX6 technology harnesses carbon fiber’s trademark strength and lightweight characteristics in an adaptable form that does not stretch. Introductory MSRP is $99.99. For further details, visit online at: 1791gunleather.com. 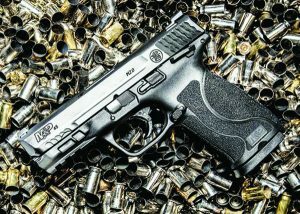 Smith & Wesson Corp. has added a .45 Auto pistol to its popular M&P semi-automatic line of polymer pistols in its M&P M2.0 Compact pistol line. Featuring a shorter, 4” barrel, a 10+1 round capacity, and the popular M2.0 feature set, the M&P45 M2.0 Compact is a popular size for law enforcement use and personal protection. Jan Mladek, General Manager for Smith & Wesson® and M&P® brands, said, “The M&P45 pistol has been a popular choice for years with both law enforcement professionals and civilians looking for a .45 Auto pistol. With that in mind, we expanded the next-generation M2.0 platform to now include the M&P45 M2.0 Compact pistol with a shorter, 4” barrel and a full-size frame.” Available with or without an ambidextrous thumb safety, the M&P M2.0 Compact pistol series includes the advanced M2.0 feature set, delivering an aggressively-textured grip for enhanced control, four interchangeable palm-swell grip insert sizes for perfect hand fit, and a light, crisp M2.0 trigger with a tactile and audible reset. The M&P45 M2.0 Compact pistol is available with an MSRP starting at $569, and comes standard with a white-dot front sight and a white two-dot rear sight, two 10-round magazines, and an accessory rail. The M&P45 M2.0 Compact pistol is also offered with tritium night sights and three magazines for law enforcement. 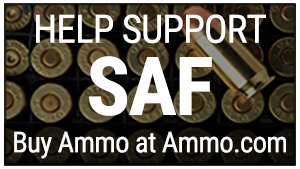 For more information on Smith & Wesson products, please visit www.smith-wesson.com.